Spark plug wires are a key element for the ignition system. The best available coil and ignition control (which you can get from MSD) will waste their performance output if the plug wires are not up to par. Plug wires have to not only carry very high voltages, they also need to do that in a challenging environment. Plug wires have to stand up to extreme heat, friction, and – at racing speeds – extreme physical forces. In addition, the connections and crimps have to be secure and be able to handle being disconnected in the pits for tune-ups. 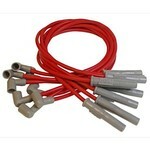 MSD delivers two kinds of spark plug wires; Street Fire and the 8.5mm Super Conductor. Street Fire plug wires are made to deliver terrific performance at a high-value price. These wires have reduced resistance and a tough, silicone sleeve, making them ideal for cruisers and street cars. The 8.5mm Super Conductor plug wire is designed to give you the most spark possible and has the lowest resistance with high EMI suppression. This plug wire is also designed with extreme-high-temp sleeving and boots, in addition to MSD’s strong Dual Crimp terminals.